This is evident in Europe’s seas, according to the newest annual bathing water quality report from the European Environment Agency, EEA, released this week. It found that Europe’s marine ecosystems are threatened by climate change, pollution, overfishing and acidification, with many of these pressures set to increase. The annual EEA report tracks the water quality at 22,000 bathing sites across the European Union’s 28 Members States, Switzerland and, for the first time, Albania. Alongside the report, the EEA has published an interactive map showing how each bathing site performed in 2013. All the bathing sites in Cyprus and Luxembourg were deemed” excellent.” These countries were followed by Malta (99 percent excellent), Croatia (95 percent) and Greece (93 percent). At the other end of the scale, European Union Member States with the highest proportion of sites with a “poor” status were Estonia (6 percent), the Netherlands (5 percent), Belgium (4 percent), France (3 percent), Spain (3 percent) and Ireland (3 percent). Coastal performed slightly better than inland bathing waters, the data shows. The ratings are based on levels of two types of bacteria which indicate pollution from sewage or livestock. These bacteria can cause illness such as vomiting and diarrhea if swallowed. The study found that while more than 95 percent of bathing sites met the minimum requirements, 83 percent met the more stringent ‘excellent’ level. Just 2 percent were poor. The proportion of sites passing the minimum requirements in 2013 was roughly the same as 2012. However, the proportion of ‘excellent’ sites increased from 79 percent in 2012 to 83 percent in 2013. At coastal beaches, water quality was slightly better, with 85 percent of sites classified as excellent. All coastal beaches in Slovenia and Cyprus were classified as excellent. Inland, bathing water quality seems to have been slightly lower than the average. Luxembourg was the only country to receive ‘excellent’ for all its inland bathing sites, with Denmark close behind with 94 percent excellent. 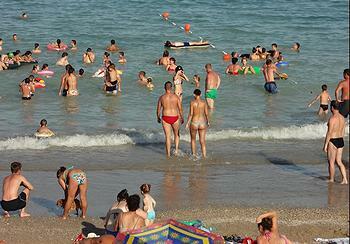 Germany achieved excellent quality at 92 percent of almost 2,000 inland bathing sites.